"Let's put a stop to this nonsense!" 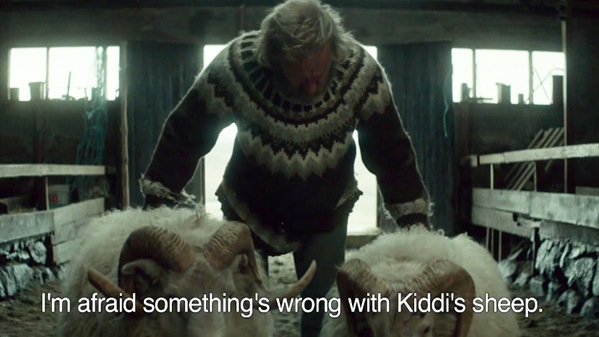 Cohen Media Group has debuted an official US trailer for the Icelandic dark comedy Rams, from writer/director Grímur Hákonarson. The film is also Iceland's entry into the Oscars this year, and they're banking on it so much the film is set for release in February right after the nominations but before the awards hit. The film premiered at Cannes, played at Telluride, Vancouver, Toronto and many other film festivals, and comes with rave reviews that are quoted numerous times in this trailer. The film is about two brothers, named Gummi and Kiddi played by Sigurður Sigurjónsson and Theodór Júlíusson, respectively, who are rural sheep farmers in Iceland that run into trouble when some of their sheep are sick. It's a great film and comes highly recommended if you're into Icelandic dark comedy. In a secluded valley in Iceland, Gummi and Kiddi live side by side, tending to their sheep. Their ancestral sheep-stock is considered one of the country’s best, and the two brothers are repeatedly awarded for their prized rams who carry an ancient lineage. Although they share the land and a way of life, Gummi and Kiddi have not spoken to each other in four decades. When a lethal disease suddenly infects Kiddi’s sheep, the entire valley comes under threat. As the authorities close in, the brothers will need to come together to save the special breed passed down for generations, and themselves, from extinction. Rams is both written and directed by Icelandic filmmaker Grímur Hákonarson, of A Pure Heart and Summerland previously. The film is Iceland's Foreign Language Oscar entry, and first premiered at the Cannes Film Festival earlier this year. Cohen Media Group will release Rams starting February 3rd, 2016 early next year. Thoughts? Those names are fun to try and pronounce. // This looks lovely.